ScotCHEM is a mature strategic collaboration, pooling and enhancing resources for chemistry research, and research training, in Scotland. It brings together seven universities, and other major players in the chemical sciences, to generate enhanced critical mass and collaboration and to enable wider access to major facilities. ScotCHEM is committed to excellence and to providing the highest quality postgraduate education and researcher experience. It is a core aim of ScotCHEM institutions to work both with industry, and across disciplines, to provide thought leadership, and economic advantage for the benefit of all. The ScotCHEM umbrella structure encompasses two integrated university pairings. 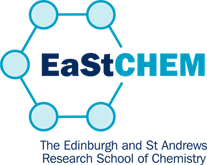 Acknowledging their geographical proximity, as well as the complementarity of their research programs, Glasgow and Strathclyde together form WestCHEM, and EaStCHEM, brings together Edinburgh and St Andrews. These pairings are more integrated than ScotCHEM as a whole, and unlike ScotCHEM, they make joint submissions to the Government’s Research Excellence Framework. Aberdeen, Dundee and Heriot-Watt are the other full members. Each member is represented on the ScotCHEM Executive Board and benefits from enhanced research networks, collective strategic planning, and from the improved access to information and resources provided by the collective “whole”. The creation of critical mass in key research areas. The maintenance of a broad and diverse intellectual capacity, ensuring long-term flexibility and responsiveness. Cooperation, not competition, between its members, generates a collaborative and intellectually active culture capable of competing with major chemical research centres worldwide. The coordination and enhancement of facilities and technical support infrastructure in Scotland. The Coordination of the planning and promotion of research activities. ScotCHEM is grateful to the Scottish Funding Council and its member Universities for financial support.